Group visits welcome by prior arrangement. There are plenty of activities to amuse the children. A choice of four free children's quiz sheets are available, with a guaranteed prize on completion, plus, puzzles, books and an opportunity for everyone to try lace making. Access: Hearing loop, stair lift, audio guide, magnifying glass, large print guide, torch and a wheelchair are available on request. 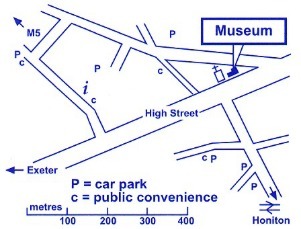 How to find us: Allhallows Museum is in the centre of the High Street next to St Paul's Church. Public car parks are signposted. The town has one hour parking in the High Street and a car park with toilets is 400 metres away. Level, wheelchair access from the High Street to the Nicoll and Norman Galleries by a separate door which is beyond the main entrance. Press the bell on the red door in the porch for assistance.